Most women don&apos;t need to start getting an annual mammogram to screen for breast cancer until they turn 45, according to the latest guidelines from the American Cancer Society. Previously, the society recommended women start annual mammograms at 40 and continue every year for as long they remained in good health. The new recommendations also say women can cut mammograms back to every two years once they turn 55 — if they have an average risk for breast cancer. These women can continue that routine as long as their overall health is good and they have a life expectancy of at least 10 years. The guidelines "can result in a dramatic reduction" in the risk of breast cancer, says Richard Wender, the society&apos;s chief cancer control officer. He says that&apos;s because they focus on screening women who are most likely to benefit. A review of the most recent research necessitated the change, Wender says. Those data indicate that earlier and more frequent mammograms unnecessarily subject women to the downsides of mammography — including the false alarms that can result in women being called back for more tests. The other major change in the society&apos;s guidelines: Doctors are no longer being advised to start breast exams annually at age 40. That recommendation is based on evidence that these exams provide little benefit and that a doctor&apos;s time could be better used for other things, such as discussing ways women can reduce their risk for breast cancer, the society says. "This is a far more tailored guideline than has ever been published before for breast cancer," Wender says, because it "essentially draws a road map of how a woman should think about screening through her lifetime." The changes are published in JAMA, the Journal of the American Medical Association, and represent the first revision of the group&apos;s guidelines since 2003. For years, the society advised women that getting an annual mammogram, starting at 40, was the most important step they could take to protect themselves from dying from the disease. 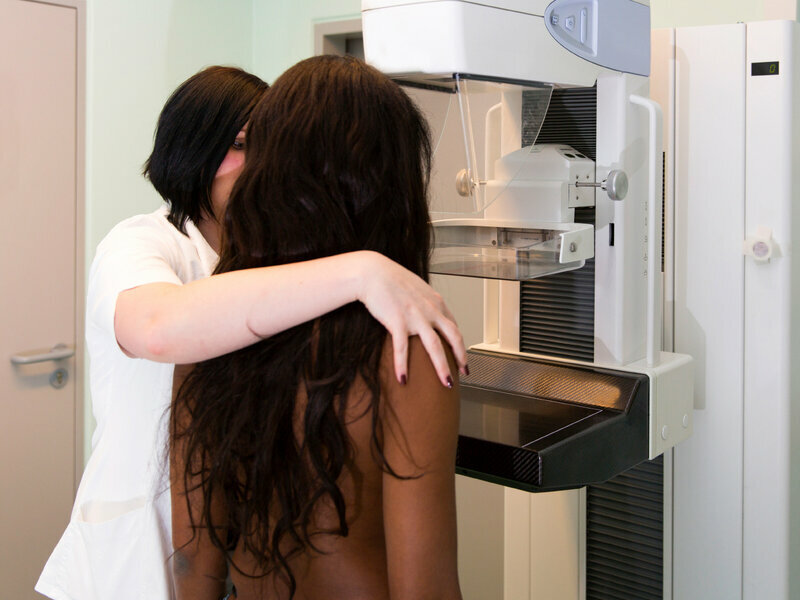 Many experts said the breast X-rays could catch cancer at the earliest, most treatable stage. But in 2009, the U.S. Preventive Services Task Force challenged that recommendation. The highly influential group suggested many women could wait until turning 50 before starting regular mammograms, and then could get one every other year. The USPSTF said that routinely screening women in their 40s subjected many to unnecessary false alarms and treatment. Unneeded biopsies could lead to avoidable radiation, chemotherapy and even surgery, which might include lumpectomies to remove tumors or abnormal cells that would never become life-threatening. Some women even undergo unnecessary mastectomies. The 2009 recommendation triggered one of the most intense debates ever in women&apos;s health, in part because the cancer society, until now, continued to back annual screening beginning at age 40. Wender says more evidence about the benefits and potential downsides of screening have emerged since then. "Today, screening guidelines are expected to judge the balance between benefits and harms," he says. "And that was actually not a standard approach in 2003, which was a time when virtually all of the emphasis was only on the potential benefits of screening." Wender stressed that the society isn&apos;t recommending against women getting mammograms every year when they turn 40 if they decide that is their preference after discussing the pros and cons with their doctor. In fact, some women should begin screening earlier if they are increased risk for breast cancer for some reason, such as a family history of the disease, Wender says. "The new guideline does recommend that women ages 40 to 44 should have the opportunity to learn about the benefits and drawbacks of screening and begin annual mammography before ages 45 based on her personal values and preferences," Wender says. Many experts think the new guidelines are an improvement and could help resolve confusion over mammography. "There really is not a single answer to the question: Should I have a mammogram?" says Nancy Keating, a professor of health care policy at Harvard Medical School and a physician at the Brigham & Women&apos;s Hospital. "It really involves looking at each patient individually," she says, "thinking about their risk of developing breast cancer and thinking about the harms." She co-authored an editorial published with the new guidelines. But it doesn&apos;t look like the new guidelines will end the debate. The American College of Radiology and the Society of Breast Imaging, for example, still recommend annual mammography beginning at age 40. Later, less frequent screening could be risky, they say. "I am personally concerned as a woman and as a person heavily involved in breast cancer screening [that] there will be lives that we could save that will be lost," says Dr. Debra Monticciolo, a professor of radiology at Texas A&M Health Science Center College of Medicine. She chairs the radiology college&apos;s commission on breast imaging. Yet others think the cancer society is still pushing mammograms too hard. "No matter how they try to slice and dice it, the reality is that mammography screening has minimal benefit and it has significant cost — both physical harm and economic cost," says Frances Visco of the National Breast Cancer Coalition. "I think all the American Cancer Society has done is really add to the confusion without helping women make an informed decision," she says. The U.S. Preventive Services Task Force recently released a draft update of its guidelines that essentially reaffirms its 2009 recommendations. But the group will examine the cancer society&apos;s new guidelines and the research supporting them as it finalizes the guidelines, says Dr. avid Grossman of the Group Health Research Institute in Seattle, the task force vice chairman.